Peralta Colleges Chancellor, José M. Ortiz led a delegation this week to Sacramento to advocate on behalf of Peralta’s students, colleges and the community. 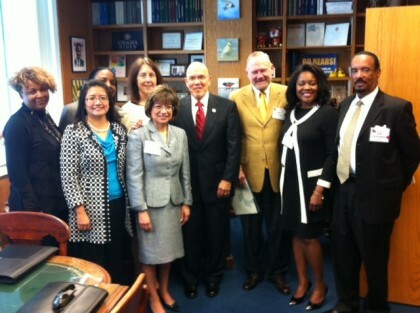 In this photo, Peralta’s delegation meets with Assemblymember Nancy Skinner (15th Assembly District). Pictured from left, Trustee Linda Handy, General Counsel Thuy Nguyen, Trustee Meredith Brown, Assemblymember Skinner, Merritt College President Norma Ambriz-Galaviz, Chancellor Ortiz, Trustee Bill Withrow, Laney College President Elnora Webb and College of Alameda College President Eric Gravenberg. The delegation also met with Assemblymember Rob Bonta (18th Assembly District) and Assemblymember Loni Handcock’s (9th Assembly District) Chief of Staff. Peralta’s legislative priorities include supporting the Governor’s proposed 3% growth for community colleges; increased funding for the Student Success Categorical Program; a focus on underrepresented students; adult education; dual enrollment; inmate education; and campus safety.